Well, I come to post these two wee finished projects with sore hands after many hours of crochet followed by many more of unpicking. Well not exactly more hours of unpicking, as crochet ‘uncrochets’ very quickly. But it feels like that when you start unravelling large pieces of crochet! Ah such is the frustration of trying new stitches and patterns I guess. When will I learn to unpick as soon as I realise I’m not happy with it? Rather than persevering as I try to convince myself it’s worth it, with just a tweak here and there. Best advice? Unpick as soon as you don’t like it, it more than likely will not get better…unless you are super clever and talented and maybe a little lucky. 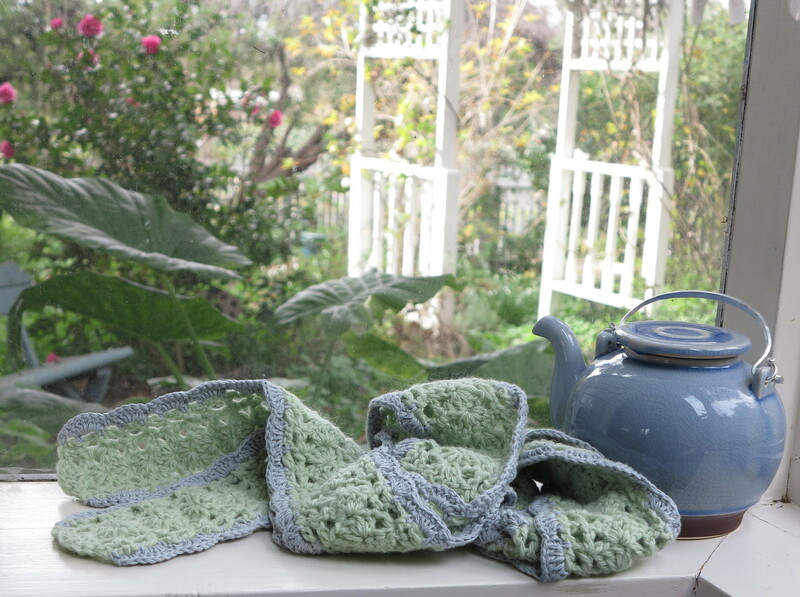 Green: 30% Alpaca, 70% Wool, Blue: 100% Cotton. I found the body of scarf pattern here, thanks to A little slice of life blog. 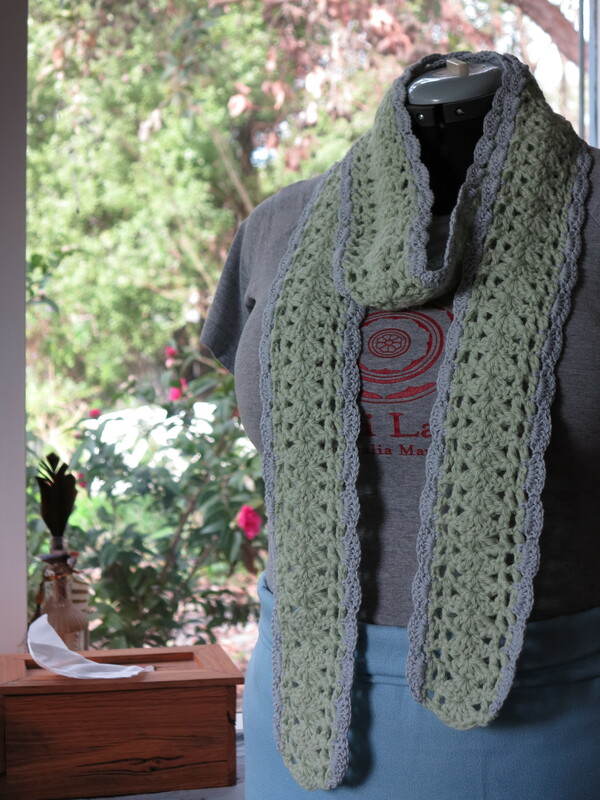 It’s a nice open lacey stitch that works well for a scarf that is not too bulky but still adds warmth. I added a simple contrasting scalloped edge. I am a fan of blue and green together and I think these pastel shades blend beautifully. 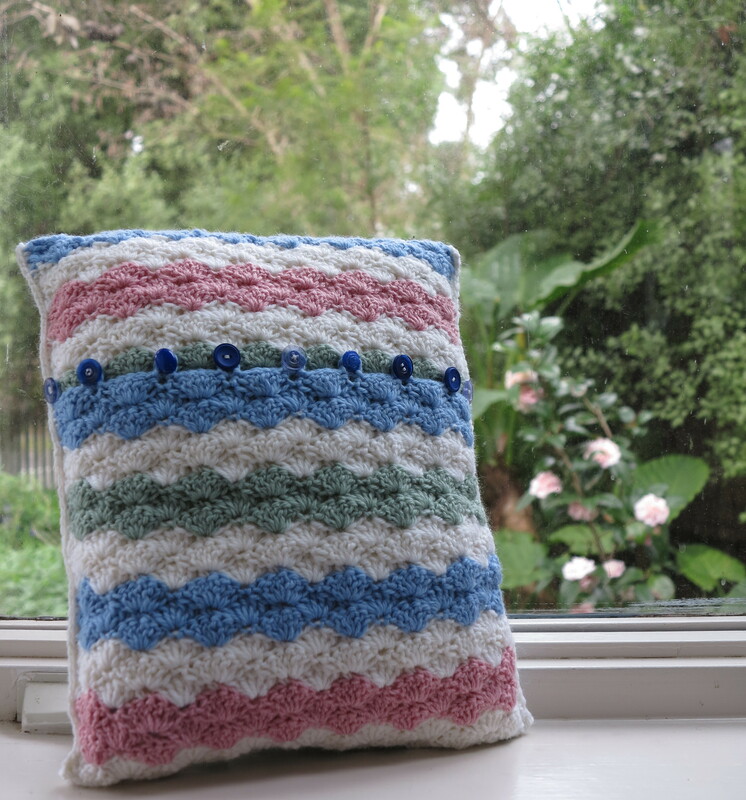 Using a mixture of little blue buttons and lots of left over wool, this little cushion was whipped up in no time. So now I’m off to crochet some already well crocheted yarn…into yet another incarnation… which will hopefully not require another unpicking session. And how about you? Have you been unpicking lately? Do tell. In the meantime happy crafting to you, and may your unpicking always be short! This entry was posted in crochet, Uncategorized and tagged 100% cotton, 100% wool, buttons, crochet, cushion, fan stitch, scarf, unpick. Bookmark the permalink. I love that scarf! It looks so pretty!